Just over a week ago I was in Waynesville NC to hear the Jazz Cats play at a local night spot, the Classic Wineseller. This trio features my cousin Bonnie Rossa on flute and vocals, Brad Keller on piano, vocals and keyboard bass, and Jean Bolduc on drums. Because of their tremendous talents, experience and the synchronicity between them that only a long-term friendship could create, as I heard them play I deeply felt the music in a whole new way. Of all things music is emotional, and I have had it bring me to tears -- as when a pianist Michael Yanette plays Someone to Watch Over Me, that became a song of love between my cousin and her father, or the Jazz Cats play Autumn Leaves that my own father loved to sing around the house or in the car. But never before have I known music to lift me up, stir my blood and send it soaring as it did when the trio played Icarus. Why had I never heard this before? Or had I heard but never listened? Composed by Ralph Towner and recorded by Paul Winter in 1973, it was mostly intended for strings and Winter's soprano sax. About two minutes into the song the emotion really begins to build. I have listened to a couple of Winter's recordings which are great, but I find I prefer the Jazz Cats version using flute, piano and drums. Somehow it feels less restrained. When I saw them play, I think the three of them were caught up in the joy of the music and the feeling of flight, and took the audience with them. What has this to do with writing? Well, music tells a story. And what author does not want to write like the wind, get caught up in the emotion of the story they are telling and lift their readers up in exactly the same way? Most of the time writing is like slogging through the mud, but then that joyful inspiration comes and you cannot stop your fingers from skipping across they keyboard (nor would you try). You are flying. You are flying. And, because the main character of the book I am writing is someone who dreams of soaring in a way, to elevate his life and claim his heritage, this song of Icarus helps me think about and experience what he feels when he dreams of his future. Music can be such an inspiration, and I forget that sometimes. Thank you Jazz Cats for lifting me up. 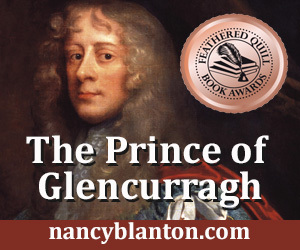 Nancy Blanton is the author of Sharavogue, an award-winning novel of 17th century Ireland and the West Indies. She is at work on two more novels, and also has published a children's book, The Curious Adventure of Roodle Jones. Find her books on amazon.com, barnesandnoble, and ibooks.